I’ve had lots of messages from my wonderful tribe asking me for lunch box friendly, savoury muffins so here is one of my favourite recipes with some sneaky veggies added in! Why my savoury muffins are so damn good! I like to eat these before a workout but if I’m peckish on the weekend, they work well as a snack or even a late breakfast with a nice hot cup of tea. They are perfect for diabetics, people with cardiac issues or anyone wanting to live a healthy lifestyle. I make a big batch of these on the weekend and they last me all week in the fridge. 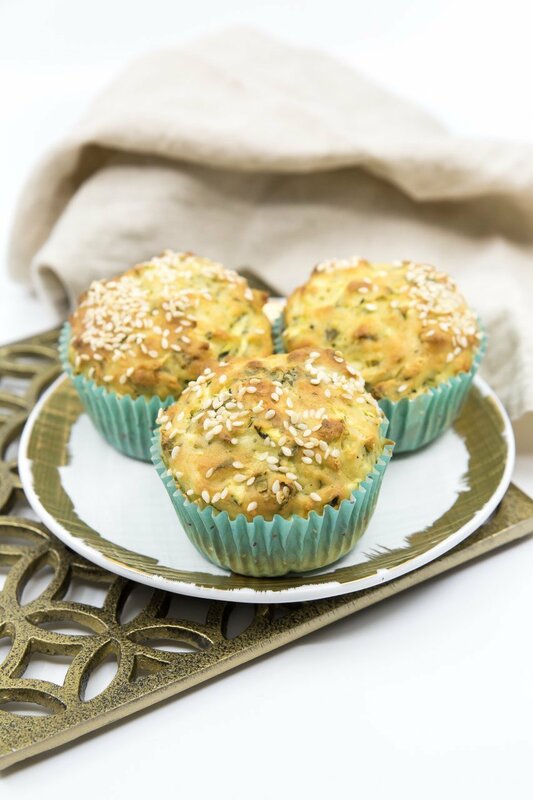 I find little children also love these savoury muffins as the zucchini can’t really be tasted and they love the sesame seeds on top too! These savoury muffins containing zucchini, yoghurt and mint will have you wondering how healthy ever tasted so good! Note: they are best served warm. If you’re eating leftovers, I recommend to zip them in the microwave for 30 seconds before eating. I hope you enjoy this recipe, if you do, please consider leaving me a comment or a star rating. Chop the ends off the zucchinis and grate them. Don’t squeeze the liquid out. These muffins have roughly: 90 cals, 1.5g fat, 2g fibre, 5g protein, 14g carbs and 1.3g sugar per muffin (note: depending on brands used etc). I used a high protein, low fat yoghurt.